Habit: Perennial herb; stolons generally 0 (in California); sap milky; herbage glabrous or with long simple hairs, shorter, branched hairs, and/or gland-tipped hairs. Stem: erect, 1--12 dm. Leaf: basal and/or cauline, alternate. Inflorescence: heads liguliflorous, few to many in raceme-like, +- flat-topped, or panicle-like clusters; involucre cylindric to +- bell-shaped; phyllaries in 2--4 series of different lengths; receptacle +- flat, epaleate. Flower: 6--150+; ligule generally yellow (white or orange, occasionally +- purple-tinged), readily withering. Fruit: generally +- cylindric (+- urn-shaped), tan to red-brown or black; pappus of many slender, brittle, minutely barbed bristles, dull white, straw-colored, or tan to +- brown. Stem: 3--10 dm, proximally glabrous to densely long-hairy and/or branched-hairy, distally glabrous or branched-hairy. Leaf: 0.8--1.6 dm, lance-oblong, generally at least some wavy-toothed, teeth widely spaced (all entire), coarsely long- and branched-hairy; cauline generally restricted to proximal stem, smaller. Inflorescence: heads many in open panicle-like clusters; peduncle branched-hairy, occasionally stalked-glandular; involucre 7--9(12) mm, +- obconic to bell-shaped, generally branched-hairy and short-glandular, occasionally long-hairy. Flower: 15--30. Fruit: 2--3 mm; pappus 3.5--5 mm, +- white. Chromosomes: 2n=18. Ecology: Dry slopes, woodland; Elevation: < 1530 m. Bioregional Distribution: c SNF, SCoRO, SCo, n ChI, TR; Distribution Outside California: northern Baja California. Flowering Time: Jun--Oct Note: Plants of SnBr and northern Baja California resemble Hieracium bolanderi. Further study needed. 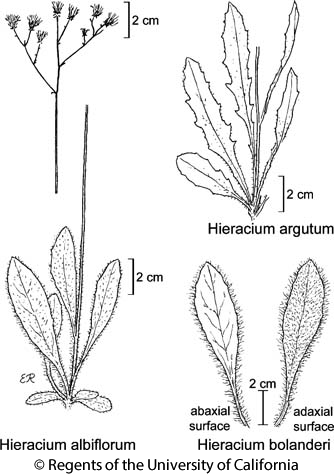 Synonyms: Hieracium argutum var. parishii (A. Gray) Jeps. Citation for this treatment: David J. Keil 2012, Hieracium argutum, in Jepson Flora Project (eds.) Jepson eFlora, http://ucjeps.berkeley.edu/eflora/eflora_display.php?tid=3477, accessed on April 23, 2019.
c SNF, SCoRO, SCo, n ChI, TR; Markers link to CCH specimen records. Yellow markers indicate records that may provide evidence for eFlora range revision or may have georeferencing or identification issues. Purple markers indicate specimens collected from a garden, greenhouse, or other non-wild location.